The Rebel Sweetheart. : Pucker Up! 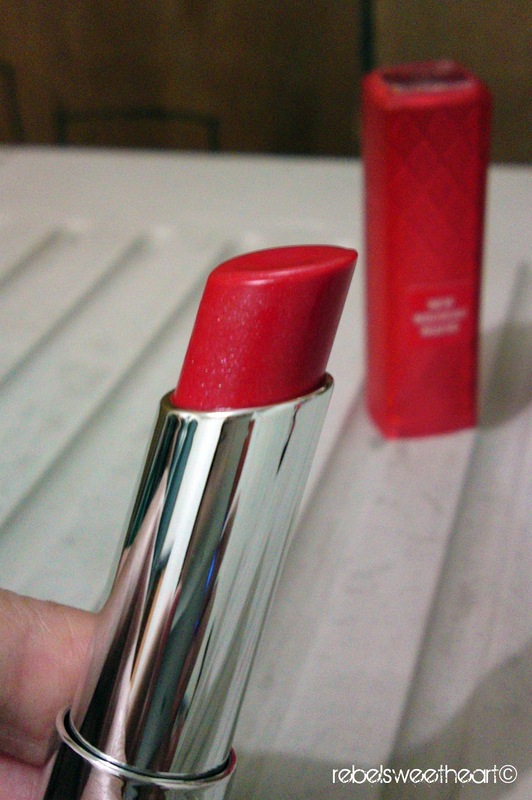 | More Revlon Colorburst Lip Butters. You know what's better than a Revlon Colorburst Lip Butter? My first, the Sweet Tart. More Revlon Colorburst Lip Butters! Plus two new babies, the Cherry Tart and Lollipop. The two new tubes are actually gifts. When my cousin discovered how much I loved my Sweet Tart, she wasted no time in buying two new colors for me. She sent them via mail, and thankfully they arrived at my doorstep safe and sound. Photo filtered via PicMonkey. Because Picnik is saying buh-bye in a few. Uncapped and placed together side by side, here's how their colors look like. From L-R: Sweet Tart, Cherry Tart, Lollipop. I feel like a kid in a candy store just by looking at them like this. Now here's how the colors look like when swatched on the skin. From L-R: Sweet Tart, Lollipop, Cherry Tart. Compared to Sweet Tart, Lollipop is a darker shade of pink - fuchsia, actually with specks of purple shimmer and light blue undertones. Cherry Tart, from the name itself, is a shade of cherry red - warm and bright, with a bit of shimmer to it. This is how they look like on my lips. That's Cherry Tart on top, and Lollipop at the bottom. Both are highly pigmented, very creamy, and absolutely hydrating. And despite the minimal staying power (two to three hours max), these Lip Butters continue to impress me with their knock-your-socks off colors and non-drying features. And I certainly will not complain if somebody - anybody - sends me more of these babies again! Sharing with This or That Thursday, Happiness Is, Pink Friday, Pink Saturday. nice lipsticks! ang sweet naman ng cousin mo for sending you these lipsticks. nice shades! Love the colors, super nice! your cousin was also so nice! very nice colors! i opt for red-brown shades for my lips. i guess it really goes with you skin color. Very lovely colors, I want some too haha..I love most the sweet tart..Visiting from Pink Friday hope you can visit back, see you..
Lovely shades of pink and red! You're tempting me, my budget can only afford Nyx lippies. =( Love the Lollipop. Ganda ng kulay bagay na bagay sa lips mo! Love the lollipop one sweetie. It looks good. :) Visiting late via Happiness Is.